Stamlanche reside high atop snowy mountains. Stamlanche's formidable size makes their gentle disposition a surprise for many. This beast shows no ill will toward smaller creatures, while also lacking natural predators. Therefore, there is little reason to explain Stamlanche's tendency to suffer chronic worry and anxiety. When Stamlanche worry themselves into a tizzy - which seems to happen with even greater frequency when they are in groups - they often reach a heightened state of awareness. While in this state, any unexpected or strange noise can send the group into a stampede, rampaging across mountain-tops and away from the source of the disturbance. 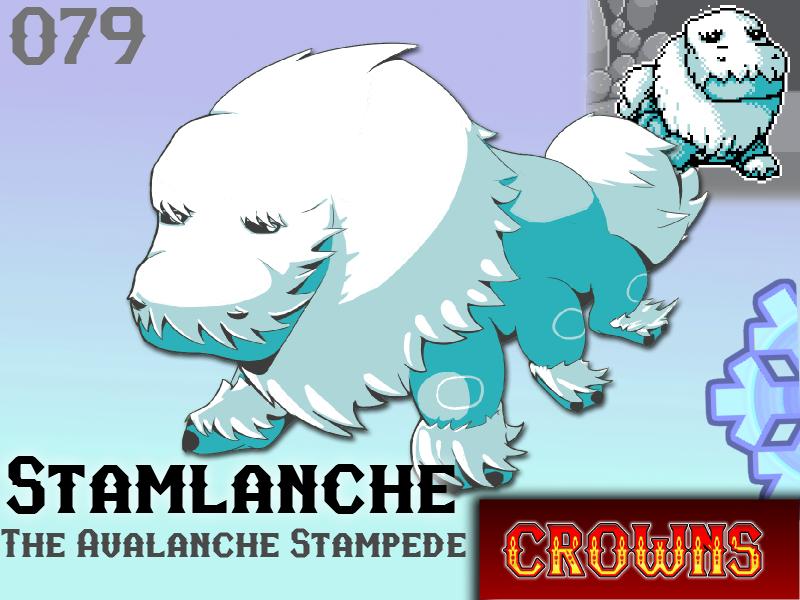 Due to their large size and weight, coupled with their natural habitat, Stamlanche is said to be the source of the majority of Avalanches around Frobec. While Stamlanche would never intentionally hurt an innocent human, they seem to have found a way to join their frozen brethren in casualty count. Will Stamlanche make your team?